Orvis Cattle Company is owned and operated by Roma Orvis. Bruce Orvis passed away in November 2010. .
Don Harper, an Orvis cousin, is the General Manager of the Orvis Cattle Company. Don first started working for his Aunt Roma and Uncle Bruce in 1976 at the age of 13. 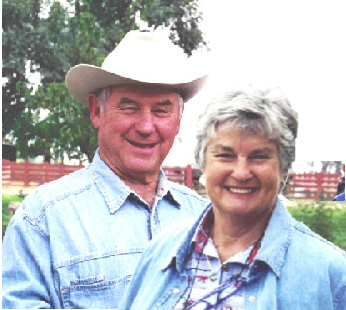 After finishing college at UCD and Cal Poly San Luis Obispo Don worked in the cattle feeding industry in both California and Nevada for 20 years. He then worked for the Foreign Agricultural Service of the USDA. Don and his wife Susan have been married for 26 years and have three daughters: Erin, Nora, and Maxine. Currently their daughter Nora Grace is working at the ranch full time. Their daughter Maxine would work there full time as well if her schoolwork didn't get in the way.